I have a couple of cool things planned for the next few months and I'm excited to share a little preview. I have ordered one of the basic suits from Indochino this time, the Essential Charcoal. I need a real versatile classic and while I have a Navy Blue Indochino and the Essential Gray, I don't yet have a dark gray one. Time to fill the gap and let's see how the new price point of $449 holds up in the review. I will also have a tailor examine the insides of the jackets to see how the new half-canvas construction looks like. 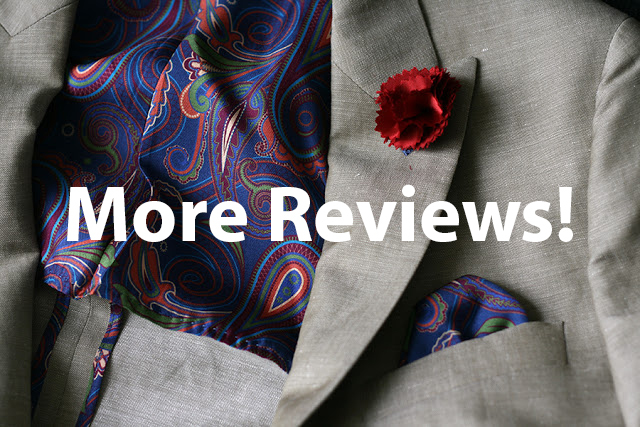 This review will also include items from an upcoming British menswear website. I believe online custom shoes will be a growing niche within the next few years. Mantorii started and did well, but stopped at the end of June. There are already a couple of companies preparing to start and I stumbled across the iShoe by iTailor a while ago. Their custom shoes can be configured using an online configuration. You can customise basically anything on your shoe, including the leather, style, sole, etc. The price is kept extremely low at €99 including shipping. I assume the leather won't be very good quality at that price point and the overall appeal of the whole thing is a bit cheap, but we will see. I have ordered a shoe and will review it as soon as it is delivered. Any experiences with iShoe/iTailor out there? Dragon Inside was mentioned as an alternative to Indochino in a number of comments. Dragon Inside sells fully-canvassed custom suits from $399, an interesting price point compared to Indochino's new entry price level of $449. I'll be receiving some fabric samples soon and will order a suit for review. There are a couple of other competitors I might give a try, I'm open for suggestions. Not quite set in stone yet, but I'll most likely be able to do a follow-up to my initial review from 2012 soon. A lot of things have changed at Black Lapel since and I know the brand is among the fiercest Indochino competitors at the moment - with a good reason. Don't forget to sign-up for the newsletter to stay informed!